Special Rapporteur on the human rights situation in Myanmar Yanghee Lee. The United Nations rights expert on Myanmar is “strongly” recommending that the International Criminal Court (ICC) investigate and prosecute those allegedly responsible for “decades of crimes” in the form a grave violations of international human rights and humanitarian law inside the country. 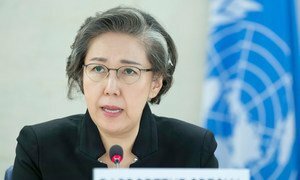 In an oral briefing to the Human Rights Council on Wednesday, Special Rapporteur Yanghee Lee underscored that accountability for crimes committed in Myanmar “is the only way” to end the long-term cycle of violence. “I strongly recommend the persons allegedly responsible for the violations of international human rights law and international humanitarian law be investigated and prosecuted by the ICC or a credible mechanism,” she said. 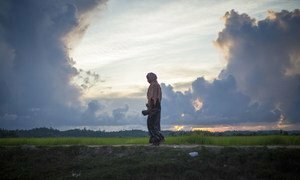 Since late August 2017, widespread and systematic violence against Myanmar’s mainly-Muslim minority Rohinyas, has forced hundreds of thousands to flee their homes in Rakhine state and seek refuge across the country’s border, in Bangladesh. Even though the number of new arrivals has tapered off and an agreement reached on establishing conditions in Myanmar to allow the refugees to return voluntarily and in safety, UN agencies on the ground have reported that such conditions are yet not present. In her briefing, Ms. Lee also drew attention to the possible war crimes and crimes against humanity by security forces in other regions of Myanmar, including in Kachin and Shan states, where other minorities have endured protracted conflicts since shortly after the country gained independence in 1948, she said. “Far too many crimes have been committed, and have been documented and reported with scant consequences faced by those who perpetrated them,” said the Special Rapporteur. The UN human rights expert also voiced “deep concern” over the “apparent inability” of the UN Security Council to unite to refer the situation to the ICC, and urged the Human Rights Council, “as a matter of urgency”, to back her proposal to establish an international accountability mechanism. She explained that the mechanism should have three components: first, to interview victims, investigate and document alleged violations and abuses, and consolidate investigations already undertaken; second, the mechanism should have legal and judicial experts to examine patterns and trends of violations; and third, the development of a framework for victim support in their pursuit of “justice, reconciliation and reintegration”. “To prepare for credible investigation and prosecution, and in order to finally put an end to decades of such crimes and to take effective measures to bring justice, I recommend that the [Human Rights] Council establishes an accountability mechanism under the auspices of the UN without delay,” she said. Special Rapporteurs and independent experts are appointed by the Geneva-based Human Rights Council to examine and report back on a specific human rights theme or a country situation. The positions are honorary and the experts are not UN staff, nor are they paid for their work. The mandate of the Special Rapporteur on the situation of human rights in Myanmar was first established in 1992. Since then, it has been extended annually, and broadened on two occasions –in 2014, in relation to the electoral process and in 2016, concerning priority areas for technical assistance. In December last year, the Government of Myanmar denied all access to Ms. Lee and withdrew cooperation for the duration of her tenure. Despite challenges brought on by the arrival of the monsoon season this month, United Nations agencies in Bangladesh continue to support nearly one million Rohingya refugees, including thousands of victims of sexual violence. Raising alarm over a “sharp” escalation in hostilities in Myanmar’s Kachin province, a United Nations human rights expert has called on all parties to ensure greater protection for civilians.